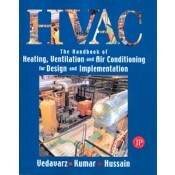 With over 1,000 pages covering all fundamental and practical HVAC design procedures and methods, this classic reference is packed with details and contains a wealth of information that is of great use to the HVAC designer and practitioner, as well as to the student mastering the intricacies of HVAC fundamentals. Unlike any other handbook of its kind, HVAC provides an in-depth treatment of topics via modular self-contained chapters that serve both as a manual for the experienced professional and as a fundamental reference for others. Each self-contained chapter places emphasis on graphical and tabular presentations of data that are useful for easy understanding of fundamentals and solving problems of design, installation, and operation. You are sure to find everything you need right here in one complete volume!